* Includes over 200 photographs and 23 interviews, and more. Haenyeo are female divers whose job and diving skills are highly unusual. They are a valuable element of Korea’s heritage, and represent a powerful segment of the nation's patriots. Like their maternal ancestors, they have scoured the island’s sea floor for centuries--harvesting seaweed, octopuses, sea urchins, turban shells, and abalone. Driven by economics, these free-divers continue to labor well into their eighties—the hardier ones often plunging 65 feet while holding their breath for two minutes or longer. However, the haenyeo are now a dying breed—perhaps the last of their generation. Their numbers have dwindled from 15,000 in the 1970s to approximately 2,500 in recent decades, and most are now in their sixties or older. 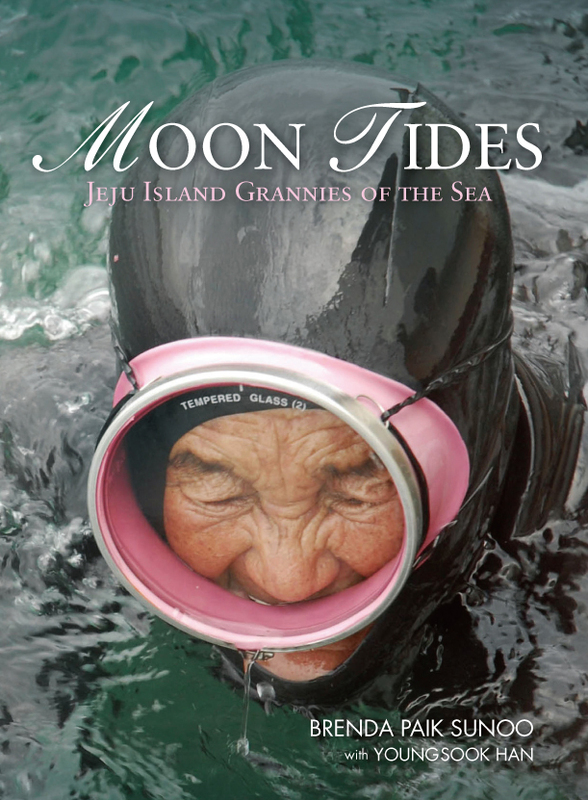 Moon Tides—Jeju Island Grannies of the Sea is the first book by an American journalist to document the lives of these rare divers through intimate interviews and photographs. Sunoo gathered these women’s stories while living in their diving villages for a total of seven months between 2007 and 2009. She was assisted on her project by Dr. Youngsook Han, a professor of English education at Jeju National University, who served as translator and interpreter. Moon Tides—Jeju Island Grannies of the Sea is Sunoo’s homage to these aging divers. It is organized into seven sections—each revealing how their multi-dimensional lives have been “lifted by the wind and tides” of survival, shamanism, suffering, aging, compassion, family, and the future. Through photos and translated interviews, Sunoo has represented the women (ages 39–93) in their own voices and work/life environments—not only in their rubber suits. “When I turned sixty, I began searching for inspiring role models...aging women who remained active until they died. Not women who died because they had regrettably aged." Moon Tides is now on sale at amazon.com and seoulselection.com.